Litters: "C", "D", "F", "G", "O"
"Kesha" was born in our cattery of our lovley queen Zima Sueno de Pantera and stud from "Mon Amour" cattery FIN*Arhantin Coppola. "Kesha" was born the biggest kitten with big round funny head. All my friends tald me, that Akela will stay with us, but I didn't think so. When he grown I decided leave him in the cattery. 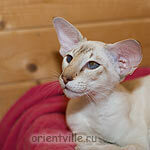 Akela is a base cat in my breeding program, I try to create a line with his name. So we have a lot of his descendants in our breeding program. At the moment he is a happy neuter and lives wis us at the cattery.